This is the childrens playground several hours after the peak. 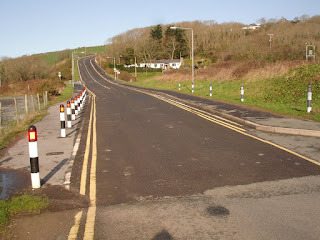 This is a flood after the major flood protection scheme has been finished, it is intended to instal a computer controlled system but this cannot be totally reliable. 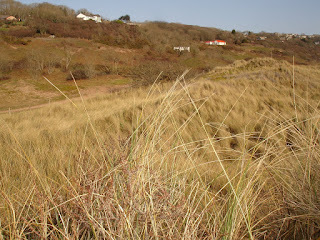 Since the establishment of the Pembrokeshire National Park, Freshwater East has been designated for development. Since then there has been a continuing battle with Govan Davies to prevent him fencing and developing plots here. All my lifetime the burrows have been open to all, from the twenties to my knowledge, local people have treated it as theirs, people arrived at the end of the summer term and camped here until the start of the Autumn term. Families,Scouts, Guides, Church and Chapel Groups. 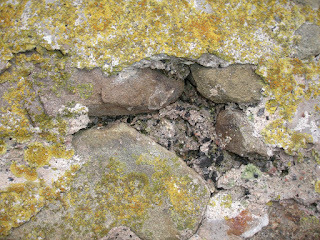 This shows what happens to cement pointing on a limemortar wall, the pointing separates from the stones, water penetrates but cannot evapourate, the mortar softens, swells and pushes the pointing off. This only takes years. 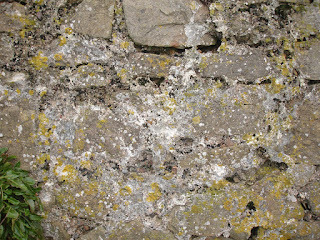 This photograph shows where ivy has penetrated the mortar,even then the high aggregate mortar is sound and if repointed with a thin coat of lime mortar will self repair. If left, unless it affects stability, it will stand for another hundred years. With the collapse of agriculture in the county, most farm houses and outbuildings are no longer used to house agricultural workers. They are being refurbished as dwellings. This is work in progress on a house built of limestone fieldstone with a rubble and high aggregate core. Completely enclosing it in cement render. The latest fashion appears to be mock rustic, in a conservation area the builder has been told to redo the finish to smooth, why not here? 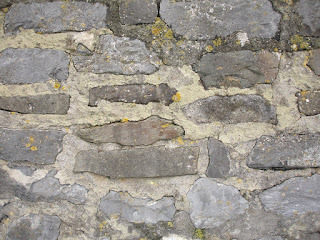 This is a wall of limestone and lime mortar probably untouched for more than a hundred years, the mortar is self repairing and does not need attention. Freshwater East Village Green Hearing. The enquiry to establish the Burrows area of Freshwater East as a Village Green will be held at the Lamphey Court Hotel opening at 10.00 Tuesday 20th March 07. If you wish to appear or give evidence the closing date is Friday 15th February. Enquiries to Lyn Thomas, Commons Registration Officer, PCC. Haverfordwest. 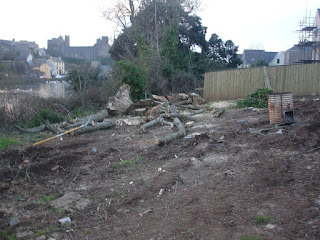 Despite agreements and consultations with all the interested bodies the screen of trees have been thinned some cut down and the undergrowth cleared, by a total predictable decision at a closed site meeting to facilitate the developers by officers of PCC. 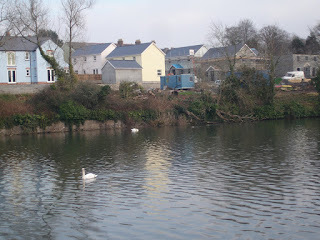 Planning permision was granted for building on condition that a strip was left untouched on the banks of the Mill Pond.The site behind Woodbine Terrace is a sensitive area as the last area of shore for foraging nesting perching roosting, and for mammals in these ponds. Now this are has been destroyed, the Mill pond has no further conservation value. 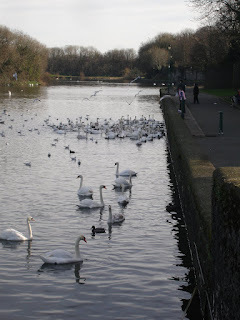 It remains as a grossly polluted,swans lavatory, so overcrowded that all natural behaviour is denied to the waterfowl . Their one function is to look pretty for the tourists. 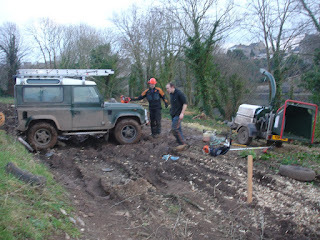 .The removal of vegetation and fallen timber from the site both of immense wildife value. .Th destruction in progress. Reliable contractors who will move immediately to serve the developers needs. 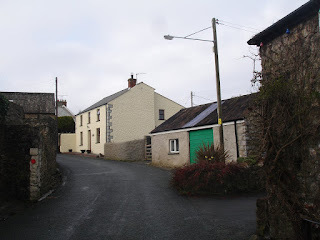 .A council officerPCC , the owners should be able to do what they wish to their own property. 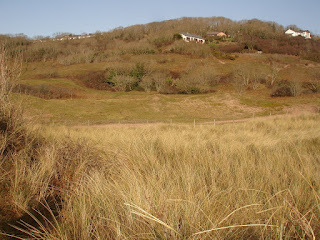 .Developer, We would find it difficult to sell these properties without a view. .Senior PCC officer, planning permission should never have been granted in the first place. 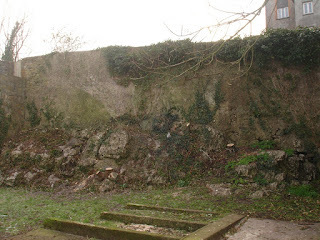 These trees have been cut downto remove one reason why Somerfield should not be able destroy further burgess plots to make a car park within the town walls. 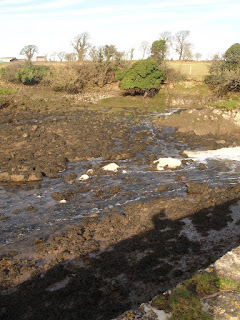 Todays Disasters,the North Shore of the Mill Pond Pembroke. 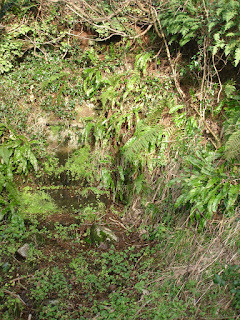 In the days of horse transport,and animals driven to market there were many spring supplied water troughs at the foot of hills by the side of the road. When water was privatised where it was possible the water supply was cut off to free water troughs. There are very few left, those that still have a water supply should be cherished. Bird Flu does not cross the species barrier to infect humans easily. One of the proven methods is by close contact between children with an existing flu virus infection and waterbird faeces. 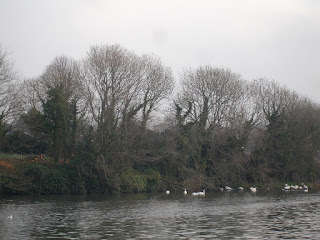 This can only occur by serendipity, and is only a marginal possibility, this is a photograph taken today of the Pembroke Mill Pond which has a high coliform load, by swans and other migrating birds in an artificialy high concentration. Children with their parents feed them large quantities of white bread. The birds fight and splash, this close contact between children and migratory wild fowl is an unneccessary risk to us all. This can be easily solved by openning the barrage, and the sluice gates and allowing the ponds to revert to their historicaly tidal cycle. The majority of the swans will then leave. 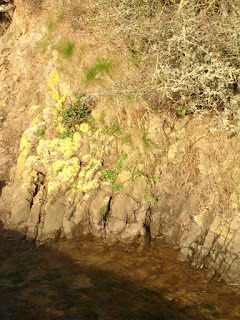 This is how to manage an estuary site,contrast with the shore of Castle Pond Pembroke. Carew Pond has been conserved by the National Trust. 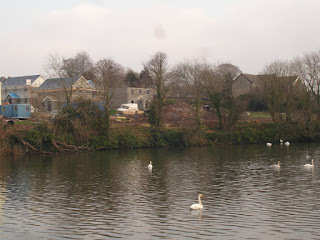 These two photographs,or the Castle Pond Pembroke Which do you prefer and which has the most value for conservation. 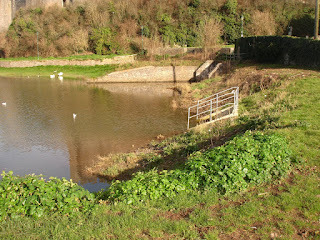 This is Castle Pond, constrained by a barrage, now freshwater, previously salt, marginaly usable at the upper end of coliform count. Until a year ago managed by total weedkiller by PCC. Of no conservation value . The constant water level negates the flood prevention measures recently undertaken on the Commons by PCC. If there is a rise in water in the stream the barrage gates have to be opened so that the commons do not flood, who does that in the middle of the night, at the very first deluge the Commons flooded.